The Divine Diva revealed that Casa Esperanza is soon to be a rest house that they plan to open to the public in the year 2020. Zsa Zsa Padilla has started getting work done in her next venture as a businesswoman. 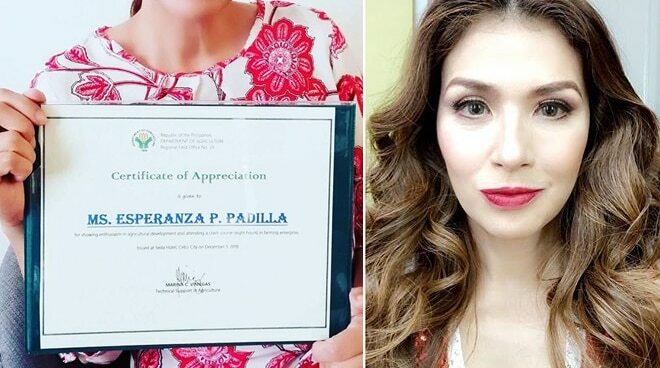 This was revealed on Instagram by the Divine Diva herself as she recently showed off her Certificate of Appreciation for taking a crash course on farming enterprise, in preparation for her project Casa Esperanza. “Finished my introductory lecture on Agriculture with Mrs. Marina [Vinegas] of the Department of Agriculture, Cebu. I still have so much to read and learn online! Mrs. Marina will be with me after Christmas to do a site visit at the farm we are trying to develop. This one is called Esperanza Farms,” shared Zsa Zsa. READ: Zsa Zsa Padilla, tinanggal ba sa ASAP Natin To? Casa Esperanza, a venture that the singer-actress first hinted in November, is soon to be a rest house that she and her partner, architect Conrad Onglao, plan to open to the public in the year 2020. “I am happy to be learning something new and working towards a goal Conrad and I have been planning for sometime now. It’s something we both love and are also passionate about,” wrote Zsa Zsa. According to the 54-year-old star, the project has since made her more aware of the efforts farmers put in to their work. “I have great respect for farmers. But now, I have a deeper appreciation for the hard work and patience they put in to make sure we have good, quality food on our tables. Conrad and I hope to do the same thing for you one day! “I dream of becoming a good farmer and not be afraid of the challenges that comes with this new, exciting venture. The work ahead may be overwhelming but with [God’s] love and guidance, I know that I will be able to pursue all of my dreams,” said Zsa Zsa.